Sixth graders study the ancient Egyptian pyramids. Sixth-grade students commonly study the culture and geography of ancient Egypt as part of their world history social studies curriculum. The study of mummies, pyramids and hieroglyphics proves intriguing to most students and compels teachers to incorporate a number of different subjects into the unit, such as math, language arts and science. By choosing engaging hands-on activities, teachers can create interactive sixth-grade ancient Egypt projects that help make history come alive for their students. Building pyramid models incorporates geometry into the history lesson. 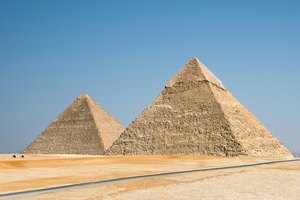 Encourage students to make three-dimensional models of the ancient Egyptian pyramids. 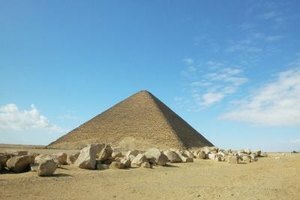 Provide books and illustrations of the pyramids so students can design their models. 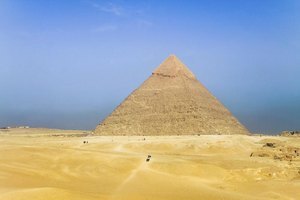 You can incorporate math into this project by requiring students to translate the scale of the original pyramids to the scale of your chosen building medium. Sugar cubes or Legos make good building materials. Items the deceased might need in the afterlife are placed in the tomb. Explain the process of mummification and its importance to the spiritual life of the ancient Egyptians. Talk about their concept of the afterlife. Show pictures of King Tut’s tomb and talk about the objects found there. Discuss the different layers involved in mummification. You can have students practice mummifying dolls to gain first-hand knowledge of the process. Students can create a tomb for their mummy out of a shoe box and include drawings or replicas of items to be included. Creating a dictionary can help build your students' vocabulary. Have students make a dictionary of important terms and their meaning for ancient Egyptians. You could require students to come up with one term for each letter from A to Z -- such as “A” for afterlife -- define it and describe its importance in ancient Egyptian culture. Student can use hieroglyphics to write secret messages. Talk about the use of hieroglyphics in ancient Egyptian society and the importance of the Rosetta Stone to our knowledge of the ancient Egyptian culture. Write a short phrase in hieroglyphics and have students translate it. In reverse, have them translate their name or a short phrase into hieroglyphics and display it on a poster. Writing a diary takes the students inside the mind of an ancient Egyptian. Assign specific topics from ancient Egyptian history, such as the flooding of the Nile valley, a typical family meal or helping to construct a pyramid, and let students create a diary with passages about each of these topics. Alternatively, you could ask students to pick a person from ancient Egyptian history and write a diary from that person's perspective, detailing events that occurred during their lifetime. Encourage students to dress as this person and give an oral report to the class explaining events in their diary. Where to go and what to see in Ancient Egypt. Instruct children to create a travel brochure of ancient Egypt that includes a map of the region and information about the languages spoken, the government, the climate, daily life, transportation, important events such as major religious ceremonies or battles, and cultural sites such as the Valley of the Kings. Students can use desktop publishing software to prepare the brochure and the map or use word processing software to create their brochure and hand draw the map on a blank page. Carson, Erin. "Ancient Egypt Sixth-Grade Project Ideas." 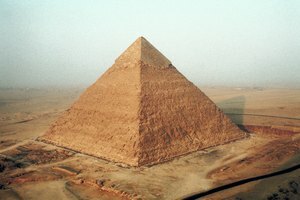 Synonym, https://classroom.synonym.com/ancient-egypt-sixthgrade-project-ideas-5853459.html. Accessed 22 April 2019.